Women around the world are in contact with natural resources on a daily basis, as food and livelihood providers. Yet, despite their role in and knowledge of the management of natural resources, women’s needs and roles in biodiversity conservation policies and plans are often not considered. The Convention on Biological Diversity (CBD) supports the conservation of biological diversity and the fair and equitable sharing of the benefits arising out of the sustainable use of the natural resources. Mainstreaming gender equality is key to achieve the goals of the CBD since the livelihoods of women and men depend on these natural resources. Thus, CBD promotes gender equality by including gender considerations in the preamble of the Convention and across dozens of decisions, which led to the adoption of a Gender Plan of Action in 2008 and an updated Gender Plan of Action in 2014. Countries present the CBD with national reports on their progress in implementing their National Biodiversity Strategy and Action Plan (NBSAP)—the main instrument to implement the Convention at national level—and in the achievement of the Aichi Targets. The most recent of these national progress reports are countries’ fifth national reports. A recent EGI analysis on how gender is considered in the fifth national reports illuminates how gender is mainstreamed throughout countries’ commitment to and work toward the goals of the CBD. 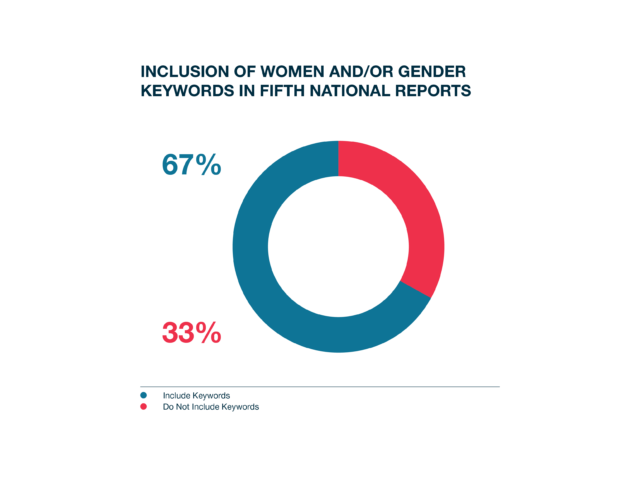 This analysis finds that 67% of the 173 fifth national reports to the CBD analyzed include at least one women and/or gender keyword in their reports. The fifth national reports, presented between 2014 and 2016, do not mention the new Gender Plan of Action for 2015-2020, or the previous version adopted in 2008. However, fifteen Parties (9%) include the contributions of women’s organizations and/or ministries during the development of their fifth national report, which indicates a commitment towards the advancement of gender equality. The ways that women rely on and manage biodiversity often differ from their male counterparts; in their fifth national reports to the CBD, 33 Parties (19%) identify these differentiated roles and recognize the importance of women’s roles as natural resource managers. In addition, nine Parties (5%) highlight the importance of women’s traditional ecological knowledge (TEK), such as Guatemala’s fifth national report, which notes the importance of systematizing and preserving the ancestral knowledge of indigenous women and men. Acknowledging the diverse roles of women and men is essential in order to introduce gender-tailored activities that take into consideration their different needs and knowledge. The EGI analysis of the fifth national reports shows that 58 Parties (34%) include activities specifically focused on mainstreaming gender consideration—such as Saint Kitts and Nevis’ inclusion of a list of initiatives to mainstream gender in the CBD—or on women’s empowerment, often including women as beneficiaries of the activity (i.e. educational program, training workshop, benefit sharing system, etc.). Identifying women as the main or one of several beneficiaries of these activities and programs responds to an attempt to take women’s needs into greater consideration, and 52 countries (30%) have characterized women as beneficiaries in their fifth national reports. Yet, women must not be considered merely aid recipients in biodiversity conservation activities. Parties must support and promote women as stakeholders at all levels of the planning, decision making, implementation and evaluation processes to achieve effective and efficient biodiversity conservation and sustainable development. Forty-nine Parties (28%) acknowledge the role of women as stakeholders in their fifth national reports, including Zimbabwe, which has encouraged women’s involvement in most of its natural resource management committees and community ownership trusts. 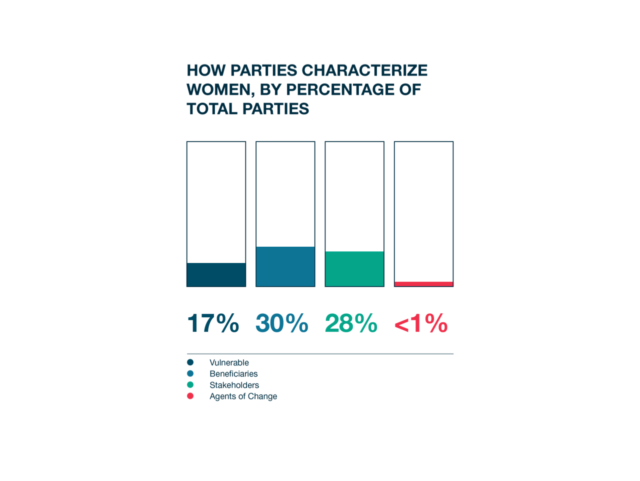 Fourteen Parties’ fifth national reports (8%) take a further step by including activities where women’s organizations are part of the implementation process, sometimes as main leaders. That is the case of Benin, where the women-led Association of Women Exploiting the Lagoon (AFEL) has conducted a training activity in solar salt production for 250 women. Cuba’s fifth national report is the only report to refer to women as agents of change. “By 2020, ecosystems that provide essential services, including services related to water, and contribute to health, livelihoods and well-being, are restored and safeguarded, taking into account the needs of women, indigenous and local communities, and the poor and vulnerable” (Aichi Target 14). Countries’ reporting on efforts to meet the gender perspective within Aichi Target 14 has been limited. Sixteen Parties include Aichi Target 14 as one of their national targets, yet only six further mention women. One example is Mali’s fifth national report, which explains how programs for decentralized forest and delta management improve women’s empowerment by enhancing their participation. Advancing gender considerations in reporting documents such as the national reports and in policies and action plans, such as the National Biodiversity Strategy and Action Plan (NBSAP) as explored in a recent EGI analysis, is an important point of departure for the mainstreaming of gender equality in environmental conservation. The recognition of women as key stakeholders and their involvement at all levels and across sectors can enhance the benefits and efficiency of the countries. This EGI analysis on fifth national reports shows that more awareness raising and capacity building may be needed by some countries in order to achieve equality between men and women in the environmental arena. In addition, a multi-stakeholder approach, including women’s organizations, may be key to identify and better understand the gender gaps in biodiversity consideration and to create gender-responsive programs.